Tonight and Tomorrow: Mostly clear skies tonight, and light northerly winds will allow temperatures to plummet quickly through the evening and overnight period. 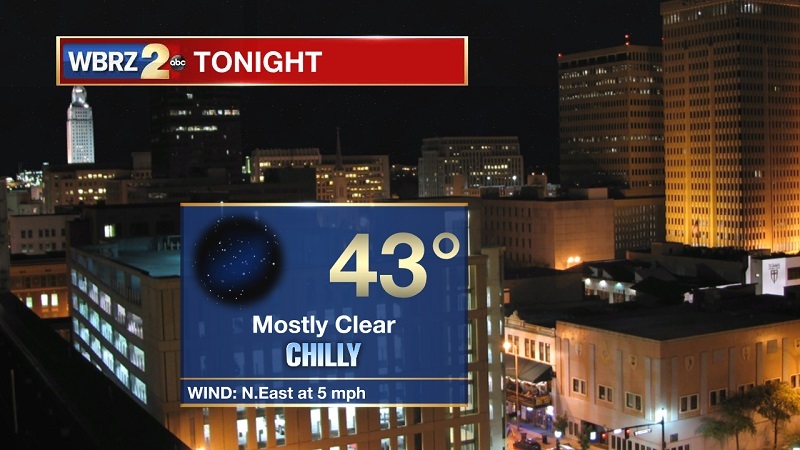 Lows will reach near 43°, as high pressure continues to keep skies clear into Christmas Eve. Northerly winds will also help to briefly return high temperatures to average on Monday, and dry conditions will also persist. Up Next: Some light morning showers possible on Christmas Day, but showers and storms are poised to increase and turn widespread Wednesday and Thursday. Showers will extend into the weekend, as highs stay elevated into the low-to-mid 70s. High pressure passes through the area on Christmas Eve, keeping clouds to a minimum and highs around 63°, which is average for this time of year. 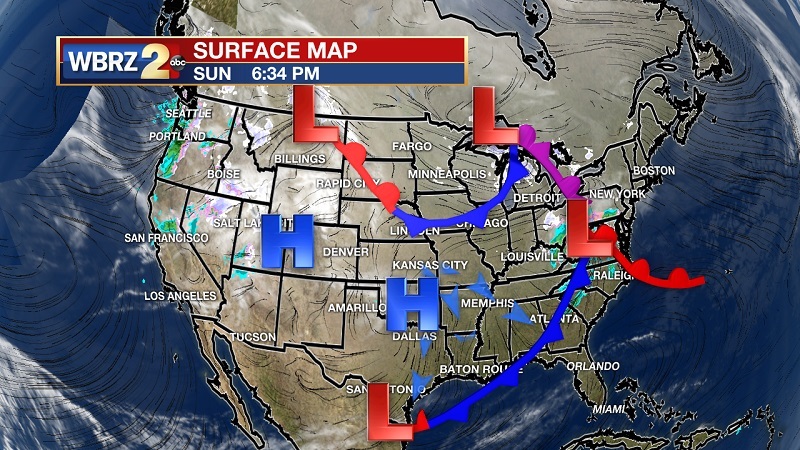 As the high pressure departs toward the east, southerly winds help to bring warm conditions back, which will extend through the rest of the week. A weak sea breeze front allows for some pockets of drizzle early Christmas Day, but a strong system moves in after the holidays. A warm front will move onshore on Wednesday, followed by a robust cold front on Thursday. These back-to-back fronts will bring significant moisture into the region. There will also be a dry line setting up ahead of the cold front as it moves through Texas on Wednesday. This line will continue into Louisiana on Thursday, elevating the potential for strong to severe storms to develop Thursday afternoon and evening. Showers will linger into Friday morning, as the cold front flattens from the Carolinas through the Gulf Coast, and into southeastern Louisiana. This will keep showers in the forecast through the weekend, as temperatures finally drop into the low-to-mid 60s beginning Saturday. Rainfall amounts are forecast between 2 to 4 inches, with higher amounts approaching 6+ inches further east.